Bathroom wall panels are the latest and best choice for your shower walls. If you are thinking of remodelling your bathroom, consider installing bathroom wall panels. There are several types of shower wall panels including acrylic, MDF constructed wall boards and PVC wall panels. It is worth noting that these panels come in different sizes and styles. As a homeowner, you are probably searching for the right panel for your bathroom. Here are great tips to help you find the right bathroom wallboards. How much have you budgeted for bathroom remodelling? Wall panels are available in different prices depending on the material used, size or design. Before you settle on a specific type of bathroom wall panel, make sure that you have calculated the cost of purchase plus installation. If you are on a tight budget, the best choice of bathroom wall panels would be PVC or acrylic wall boards. These boards will serve the same purpose, are unique and easy to maintain. Not all types of wall panels can be customised. Some panels are available in standard dimensions. Before you select such panels, make sure that you have measured your bathroom dimensions. Other panels such as PVC bathroom panels can be customised to your preferred sizes. If your bathroom measurements don’t fit the standard sized panels, consider installing PVC wall panels. We all love a great look in our bathrooms. Although tiles provide a perfect look, they are expensive to maintain. Grout holding together these tiles usually grows mould that is stubborn. As for the different types of wall panels, the cost of maintenance may differ depending on the material used. Discuss with a wall board expert the cheapest wall panel to maintain. You may want to install bathroom accessories such as soap dishes, decorative trim, a corner seat or recessed niches. However, not all panels are flexible to accommodate such additional features. A fibreglass panel, for instance, is standard-manufactured. This type of bathroom wall is not ideal when you want to customise your bathroom space. Finally, consider your preferred design. 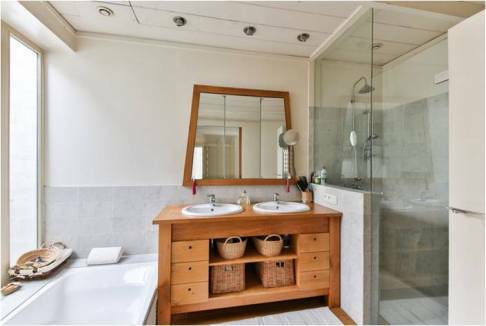 Do you have a bathroom design in mind? It is always recommended that you stick to your remodelling idea. Choose a wall panel that matches your bathroom idea. Luckily, bathroom wall panels are available in different styles and designs. These are simple tips to help you find the best shower wall board for your bathroom. You can compare the different types of wall panels from reliable suppliers. The easiest way to find the best wall boards is by searching online. It is also important to remember that these boards need a professional installer to fix them perfectly.